Montana Class Battleship: Displacement: 60,500 tons (standard); 70,965 tons (full load). Dimensions: 921' 3" (length overall); 121' 2" (maximum beam). Powerplant: 172,000 horsepower steam turbines, producing a 28 knot maximum speed. Armament (Main Battery): Twelve 16"/50 guns in four triple turrets. Armament (Secondary Battery): Twenty 5"/54 guns in ten twin mountings (ten guns on each side of the ship). The name Montana was assigned to BB-67 on 28 December 1940; but construction of the Montana class (BB-67 / 71) battleship by Philadelphia Navy Yard, Philadelphia, Pa., was canceled 21 July 1943, before her keel was laid. 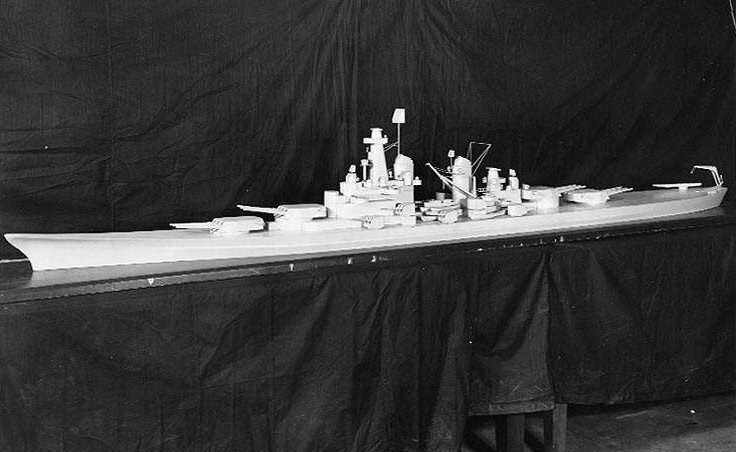 56k Model representing the preliminary design, circa 1940-41. Photographed circa 1943. Photo # NH 44529, courtesy of the U.S. Naval Historical Center. 62k Artist's conception of the Montana class (BB-67 / 71) whose construction was cancelled on 21 July 1943. 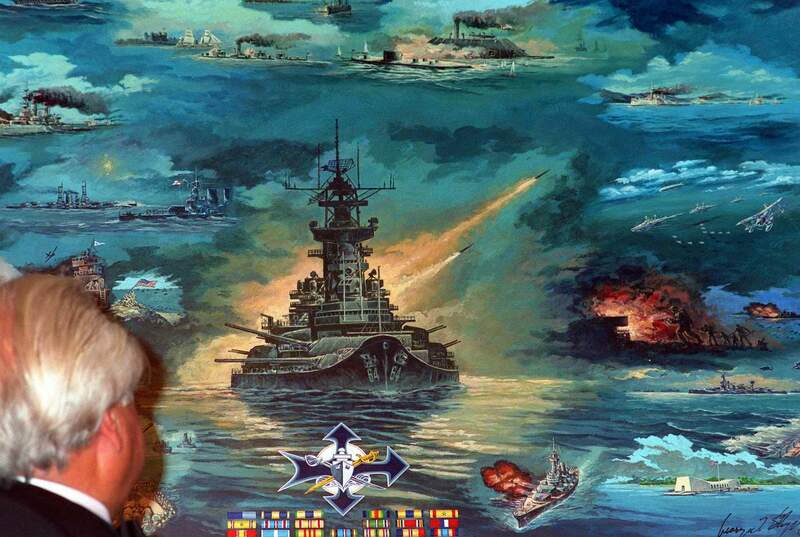 This artwork depicts the ship fitted with a heavy battery of anti-aircraft guns, as would have been the case had she been completed. Photo # NH 61246, courtesy of the U.S. Naval Historical Center. 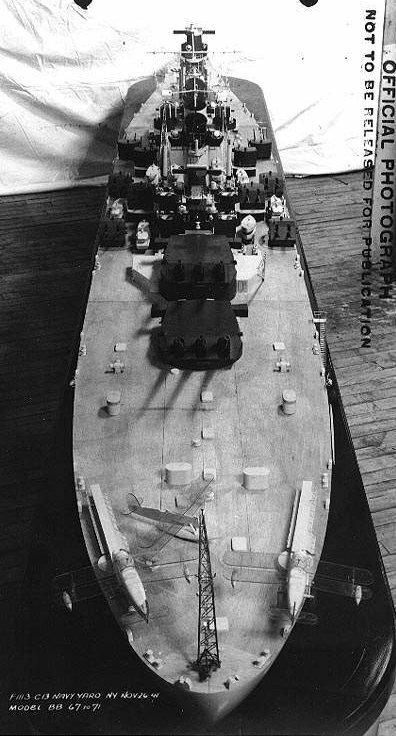 54k Model of a Montana class (BB-67 / 71) battleship photographed at the New York Navy Yard, 26 November 1941. It represents the ship with details somewhat changed from the preliminary design seen in the previous photo. Photo # NH 93912, courtesy of the U.S. Naval Historical Center. 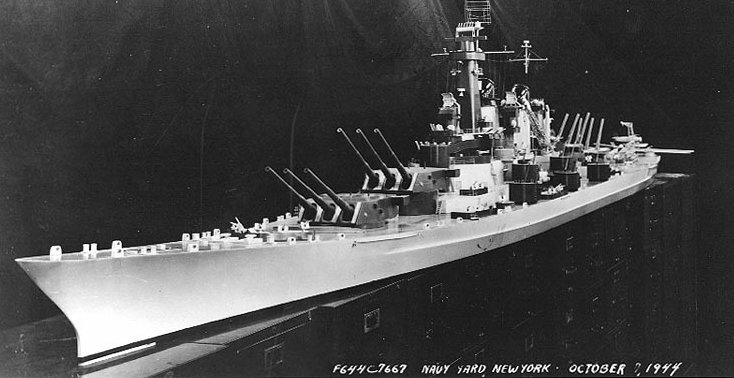 75k Model photographed at the New York Navy Yard, 26 November 1941. It represents the ship with details somewhat changed from the preliminary design seen in the previous photo. Photo # NH 93913, courtesy of the U.S. Naval Historical Center. 63k Model photographed at the New York Navy Yard, 26 November 1941. It represents the ship with details somewhat changed from the preliminary design seen in Photo #2. Photo # NH 93914, courtesy of the U.S. Naval Historical Center. 56k Large official model of this abortive class of battleship, photographed at the New York Navy Yard, 7 October 1944. Construction of the five ships of the class had been cancelled in July 1943. Photo # USN 1144964, courtesy of the U.S. Naval Historical Center. 57k Battleship Study, BB 65 - Scheme 1 and BB 61-64 (Inclusive). 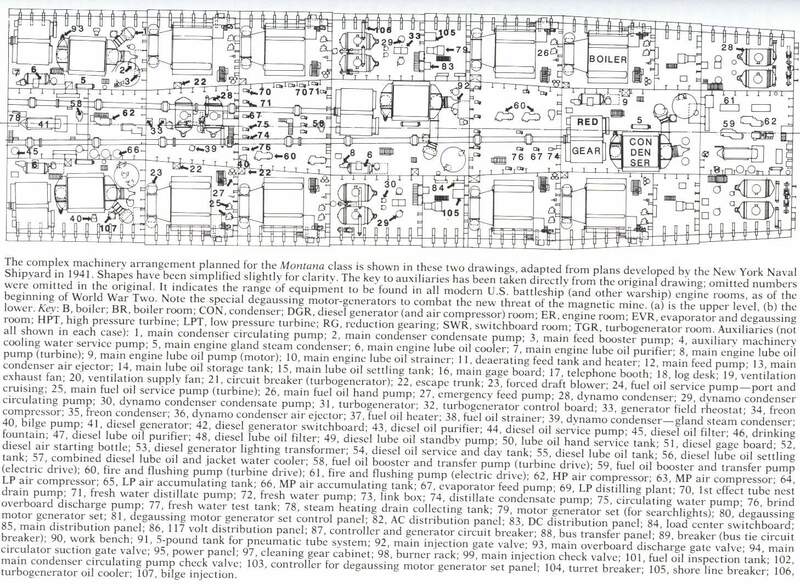 Preliminary design plan prepared for the General Board comparing the outboard profile (including superstructure) of the Iowa class (BB-61 / 66) battleships with the hull profile of the Montana class (BB-67 / 71). 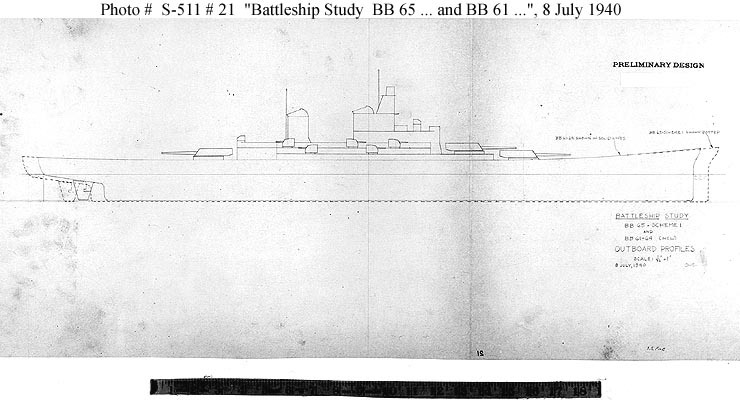 This plan is dated 9 July 1940 and shows the Iowa class (BB-61 / 66) outboard profile in solid lines and the hull of the in Montana class (BB-67 / 71) dashed lines. At the time, the Montana class (BB-67 / 71) was planned to begin with hull number BB-65, rather than BB-67 as it became after two more Iowa's were ordered as BB-65 and BB-66. Scale of the original drawings is 1/32" = 1'. The original plan is in the 1939-1944 "Spring Styles Book" held by the Naval Historical Center. Photo # S-511-21, courtesy of the U.S. Naval Historical Center. 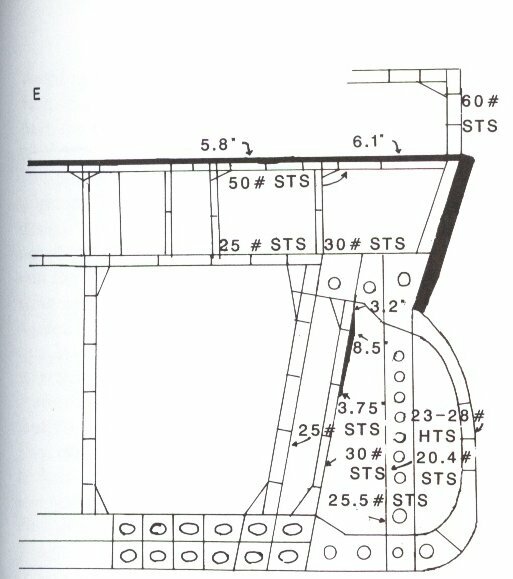 75k Battleship Design Study, BB-65 - Scheme 3. Preliminary design plan prepared for the General Board as part of the process leading to the Montana class (BB-67 / 71) battleship design. This plan, dated 6 February 1940, is for a ship of 52,500 tons standard displacement and 64,500 ton trial displacement, with a main battery of twelve 16"/50 guns, a secondary battery of twenty 5"/38 guns and a 130,000 horsepower powerplant for a speed of 28 knots. Ship's dimensions are: waterline length 860'; waterline beam 114'; draft 36'. Scale of the original drawing is 1/32" = 1'. Port side 5" gun arrangement is labeled "previous secondary battery arrangement". Starboard side has a "proposed secondary battery arrangement." The original plan is in the 1939-1944 "Spring Styles Book" held by the Naval Historical Center. Photo # S-511-11, courtesy of the U.S. Naval Historical Center. 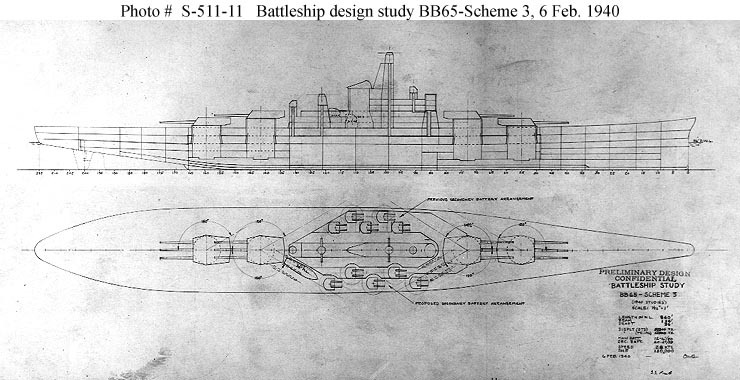 64k Battleship Design Study, BB-65 - Scheme 4. Preliminary design plan prepared for the General Board as part of the process leading to the Montana class (BB-67 / 71) battleship design. This plan, dated 14 February 1940, is for a ship of 54,500 tons standard displacement and 64,500 tons trial displacement, with a main battery of twelve 16"/50 guns, a secondary battery of twenty 5"/54 guns and a 150,000 horsepower powerplant for a speed of 28 knots. Ship's dimensions are: waterline length 870'; waterline beam 114'; draft 36'. Scale of the original drawing is 1/32" = 1'. Port side 5" gun arrangement is labeled "previous secondary battery arrangement". Starboard side has a "proposed secondary battery arrangement. "The original plan is in the 1939-1944 "Spring Styles Book" held by the Naval Historical Center. Photo # S-511-12, courtesy of the U.S. Naval Historical Center. 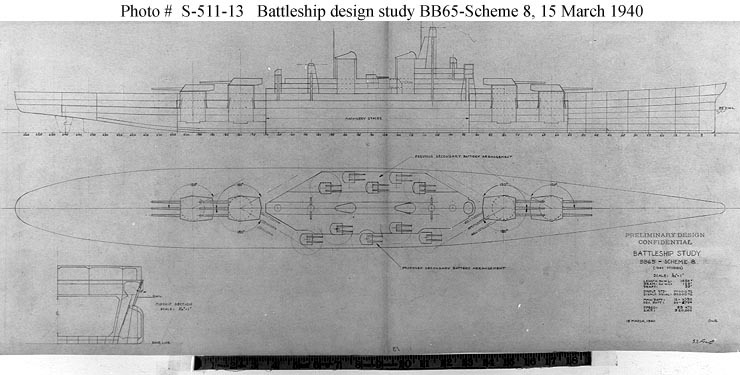 56k Battleship Design Study, BB-65 - Scheme 8. 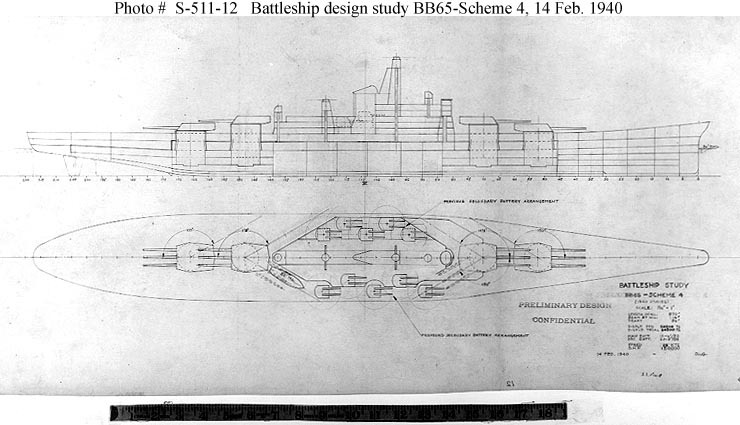 Preliminary design plan prepared for the General Board as part of the process leading to the Montana class (BB-67 / 71) battleship design. This plan, dated 15 March 1940, is for a ship of 70,000 tons standard displacement and 82,000 ton trial displacement, with a main battery of twelve 16"/50 guns, a secondary battery of twenty 5"/54 guns and a 320,000 horsepower powerplant for a speed of 33 knots. Ship's dimensions are: waterline length 1050'; waterline beam 120'; draft 35'. Scale of the original drawing is 1/32" = 1'. Port side 5" gun arrangement is labeled "previous secondary battery arrangement". Starboard side has a "proposed secondary battery arrangement." The original plan is in the 1939-1944 "Spring Styles Book" held by the Naval Historical Center. Photo # S-511-13, courtesy of the U.S. Naval Historical Center. 72k Montana class (BB-67 / 71) inboard profile as designed, 1941. Note the navigational range-finders atop turret No.3 and the bridge. The dashed lines indicate radar antennas as then planned. Photo and text courtesy of U.S. Battleships: An Illustrated Design History by Norman Friedman. 756k Montana (BB-67) as designed. Line drawing by A.L. Raven. Text courtesy of U.S. Battleships: An Illustrated Design History by Norman Friedman. Photo added by Geoffrey Robles. 124k Machinery arrangement of the Montana (BB-67) as designed. Photo and text courtesy of U.S. Battleships: An Illustrated Design History by Norman Friedman. 377k Machinery arrangement of the Montana (BB-67) as designed. Photo and text courtesy of U.S. Battleships: An Illustrated Design History by Norman Friedman. 48k Cross section of the Montana class (BB-67-71) engine room. Photo and text courtesy of U.S. Battleships: An Illustrated Design History by Norman Friedman. 177k Artist's conception of the Montana class (BB-67/71) whose construction was cancelled on 21 July 1943. This and the next two drawings represents the Montana (BB-67) in early 1945 in a modified four color Ms-32 Camouflage scheme. Drawing courtesy of Abram Joslin. 236k Artist's conception of the Montana class (BB-67/71) whose construction was cancelled on 21 July 1943. 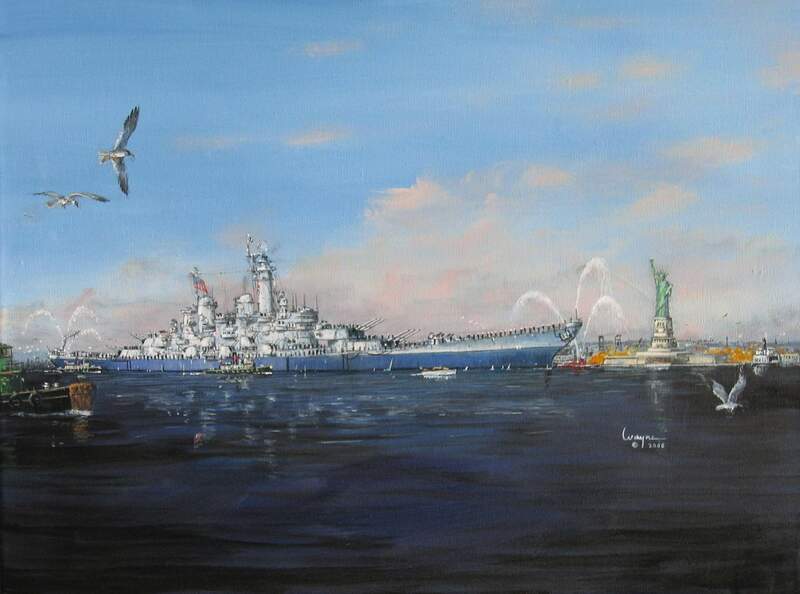 This drawing represents the Montana (BB-67) in late 1945, MS-22 camouflage scheme. Drawing courtesy of Abram Joslin. 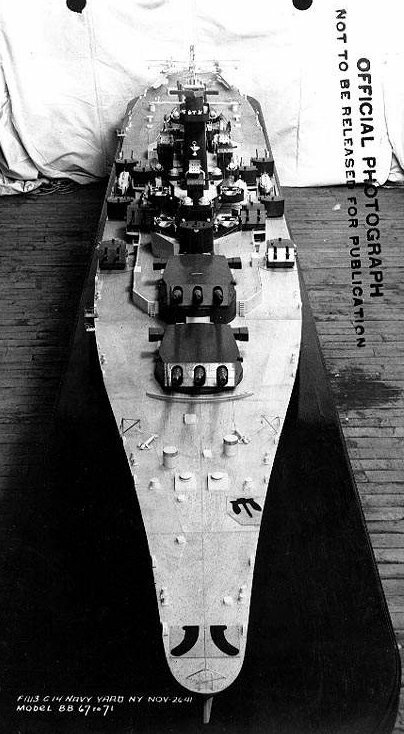 181k Artist's conception of the Montana class (BB-67/71) outline. Drawing courtesy of Abram Joslin. 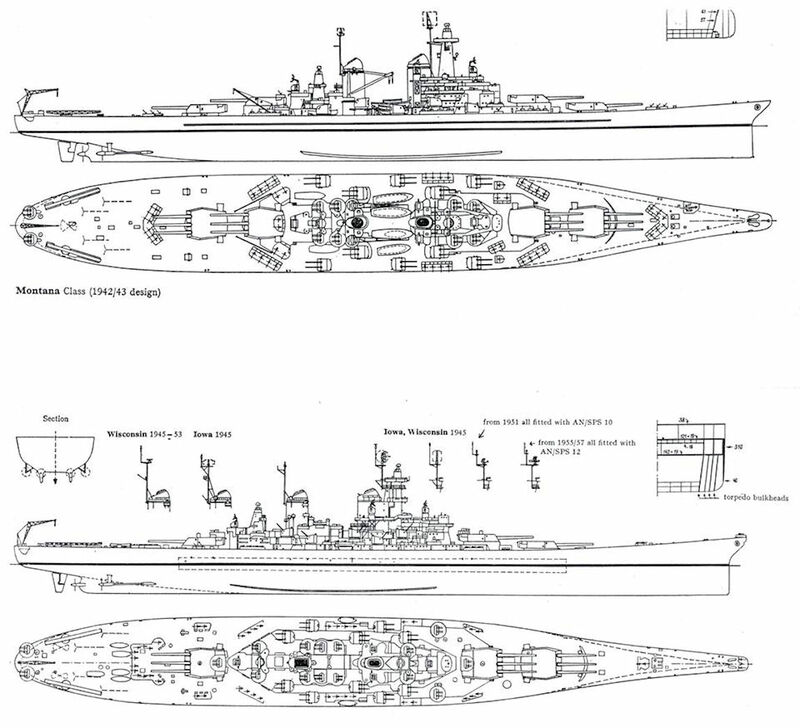 108k Artist's conception of the correct scale between the Iowa class (BB-61 / 66) and the Montana class (BB-67 / 71). Photo courtesy of deviantart.com via Bryan Fisher. 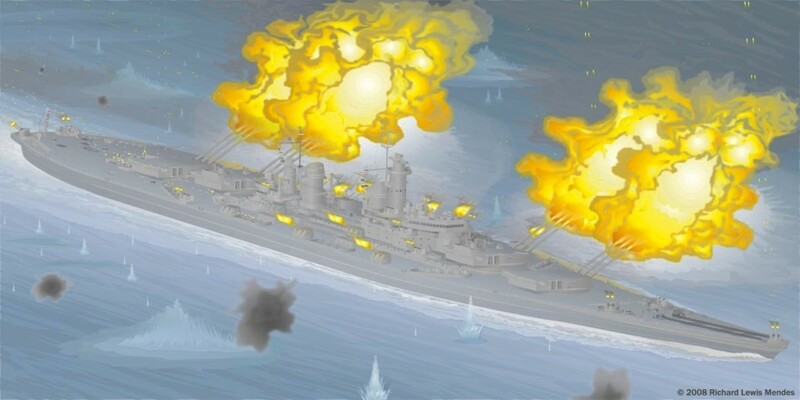 94k Artist's conception of the Montana (BB-67) in action. Photo courtesy of Richard Lewis Mendes.